This page is a guide to the exhibit which display Books, manuscripts and maps published in Japan's Tokugawa Period (1603-1868) that came to light and are were cataloged during the Tateuchi Retrospective Cataloging project in the East Asia Library. Together with Ishikawa’s “Honchō zukan kankōmoku” (first edition published in 1687), his “Nihon kaisan chōrikuzu” was referred to as Ryūsenzu. In particular, “Nihon kaisan chōrikuzu” was so popular that it was published many times over a span of one hundred years until Sekisuizu (See 03) was introduced at the end of the 18th century. Unlike other maps of Japan at that time, which were generally intended to produce accurate representations based on geographical information, Tomonobu Ishikawa who was an ukiyoe artist created a new style of maps with freeform coastlines and beautiful colors. Another reason that his maps were so widespread was that they exceeded previous maps in the amount of information they provided. During the middle of the Tokugawa period, Ishikawa lived in Asakusa, Edo (present-day Tokyo) and played an active role as an ukiyoe artist as well as a map maker. Ishikawa also was a fiction writer, who produced several masterpieces including “Shōjikibanashi ōkagami”. Yonemoto, M. (2003). Envisioning the Realm. 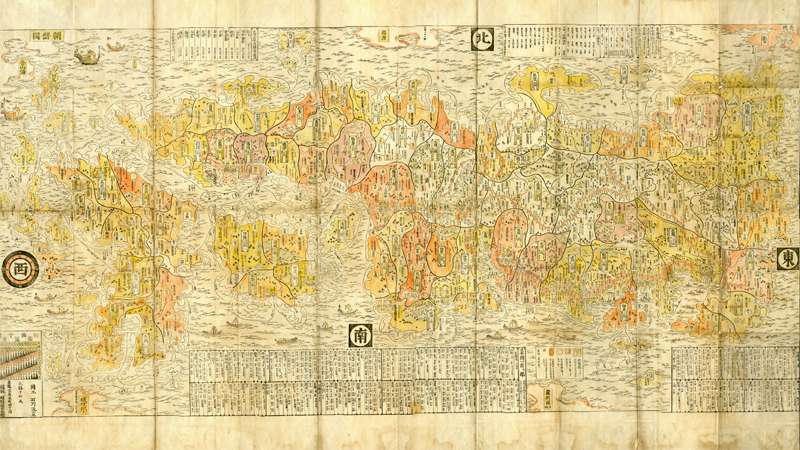 In Mapping Early Modern Japan : Space, Place, and Culture in the Tokugawa Period, 1603-1868 . Berkeley ; Los Angeles: University of California Press. DS822.2 .Y665 2003 ; Available from Project Muse UPCC Ebooks.